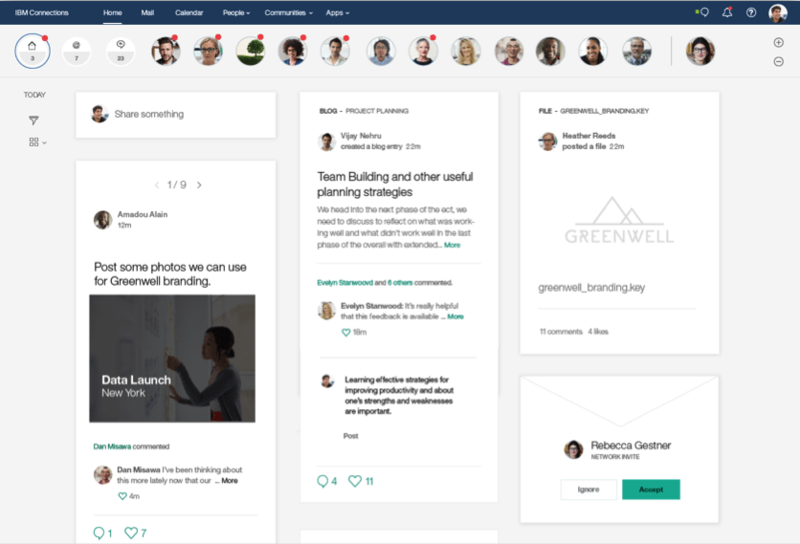 IBM Connections – best in class social platfom, which helps employees collaborate better, implement innovations and reach desired results for business. This integrated platform has high level of security, help employees find expert expertise, share and re-use knowledge and receive help in business processes. Now company works as one, joining knowledge, forces, engaging employees and forecasting new opportunities for business. IBM Connections is based on quality and information exchange methodology KaiZen and Six Sigma. Top Fortune 500 companies of the world , use proceses based on these methodologies. Join employees from silos to efficient teams, targeted to solve business chalenges. Transfer knowledge and informaiton from local resources into environment accessible for all employees. Thus knowledge and information is accumulate inside company, and is not lost when employees leave or retire. New employees are easier to adopt centrally stored documentation, projects, knowledge. Collect and realize valuable ideas, which will transform your company in innovative enterprise, giving company advantage over competitors and making clients more satisfied and better finansial results. Evaluate added value of every employee to company, finding key employees and giving back every employee feedback on their work, thus rising satisfaction and engagement. Increase productivity by using social platform, that can be accessed from any device (workstation, tablet, smartphone). IBM Connections delivers flexible platform with encreased security while allowing Bring Your Own Device strategy in company (BYOD). Implement integration with IBM products (IBM Notes, IBM Sametime, IBM iNotes and others) as well other vendors, like Microsoft Exchange, Microsoft Sharepoint, Windows Explorer (OS), Microsoft Outlook, Microsoft Office, with goal expand social capabilities of social platform of a company. User friendly interface allows business user work with various business systems from one system. IBM Connections can be extended by IBM Business partner solutions like SugarCRM, Atlassian Jira, Trilog ProjExec project management module and others. Users home page, with news and updates that are relevant to this business user. Home page can be customized with the help of widgets or branded to company colours. Corporate address book with contact information, employee photo, hierarchy in organization, list of skills. 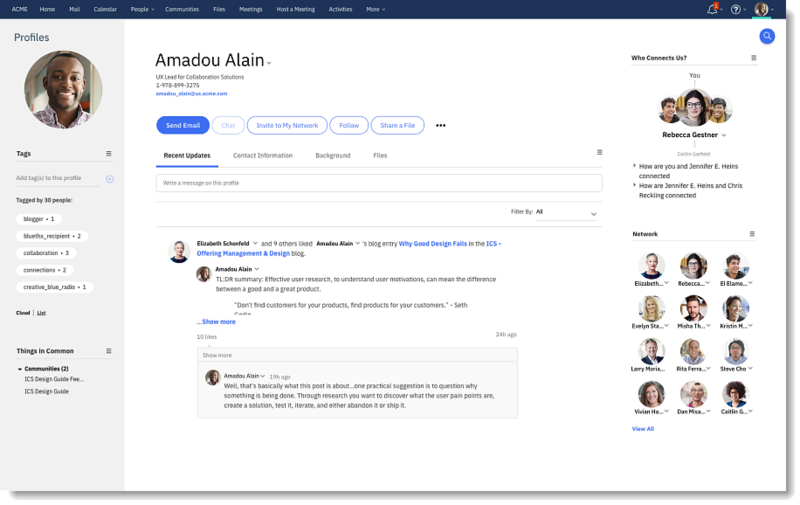 Profiles as well can be adjusted to show custom fields employee Out Of Office status, prefered type of communication (email, chat, phone, etc), prefered meeting start and end time, as well as many other attributes. Centralized corporate files storage, which supports automatic versioning of files, comments, likes. Files also offers ability to allow user create/edit files directly from web browser, eleminating need for downloading, making changes and uploading files back. BM Connections may be configured so access to IBM Connections is provided not to our employees but also to external partners or suppliers of our organization. This opens unlimited opportunities in project management, co-work, idea exchange and status updates. Teams are no longer split by firewalls or geographical locations, they work as one team. All External users are completelly free, you can invite to your IBM Connections environment unlimited number of users from other organizations. Important Calendar events of department or project group. With the help of this module users can register important events, out of office or plan vacations. This makes team aware about which important events will happen in project, when people will be away and back. Integration with email client (IBM Notes, Microsoft OutLook) allows to display these events inside users calendar on desktop or even in mobile phone. Forum allows us to ask and receive answers from experts, and later reuse answers. This will decrease load on helpdesk, will allow SelfServiceSupport concept for users, thus delivering more value to employees. Users are up to date with trends in forum. Search and keywords brings needed information to user in a blink of an eye. This module allows you to keep track on new ideas of employees, for example how to improve current business processes. One of KaiZen rules – constant innovation and improvement is reached by gathering and implementing ideas. As well people who contribute most of ideas may be rewarded and noticed by management. Smart Polls and Surveys from IBM Connections allow us gather opinions in minutes from thousands of employees. Depending on previous question answers, following answers can be hidden or otherwise shown to users, which makes Polls powerfull tool for gathering opinions. Results can be summarized as different charts (bar,pie,other) or as data that can be analyzed in external systems (.csv-files). Wiki is perfect tool for keeping documentation up to date about your busines processes and company standarts. . One of KaiZenrules is standartization, which improves quality and rises satisfaction of clients. Сommunity is a set of business users that has common goal or target. Communities can be used in different aspects, department community, project community or even platform community like Android or Apple users community. Community contains all modules that will help users to exchange valuable information. Bookmarks is a place where you share valuable internet resources with company or team. Every project or group has set of URLs shared and used daily. With Bookmarks it is easier to share, reuse valuable resources. Keyworks makes right URLs easy to find. Cодержит списки последних и значимых действий в рамках социальных процессов и интегрированных бизнес-процессов в вашей личной сети или сообществе. Вы можете просматривать материалы и события в текущем контексте и быстро принимать нужные решения без необходимости перехода к другому процессу или приложению. Введение новых людей, позволяет быстро продвигаться вперед, без необходимости пересылки десятков старых электронных писем по данному вопросу. Modern and attractive way to work with your calendar and mail directly from IBM Connections. IBM Connections Mail allow access to mail and calendar seamless from IBM Connections environment. Thus making several backend systems look as one solid platform to business people, eliminates need to switch between several applications. IBM Connections Mail works with IBM Domino and Microsoft Exchange. This additional module helps to manage projects with classical Gantt diagram, budget, resources. Includes ability to notify next task responsible that task can be started, as well as delays in project. This also eliminates problem when Project Software is available only to project manager, every task responsible is able to see pool of tasks and push project forward. Blogs has wide area for usage. Starting from news of company, deplartment or group till project management with is using Agile methodology. Blogs may contain links to Files, other company resources as well integrate externall resources like YouTune, SlideShare and many others. Realisation of modern trend of gamification in a work process. For particular achievements you can thank employees by giving them badges like «Best Employee», «Guru of technology ABC» and others. Kudos Badges gives feedback to employees, then employee understands that his work is valued and his work helps company to perform better. If feedback is not provided to employees, motivation of employees goes down, innovations inside company dies as well as company. May be your company will be next? Join the club of successful companies!